I am sorry for my lack but as you know it's time of exams and I didn't have time to go out and shoot some cool photos to upload on blog. I am so happy that page views growing up all days!I want to thank you, sweeties, because you continue to visit my blog even if there aren't new posts :) and follow me on Bloglovin too. 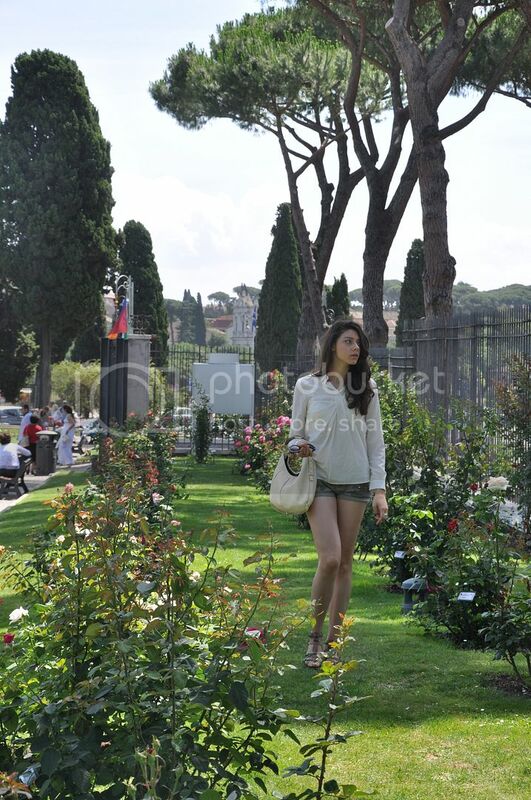 Here I am at "Roseto Comunale" (roses garden) in Aventino Hill, one of seven hill in Rome. It's a magic, romantic, peaceful, dreamly place. I like to stay on a garden steat, walk around and admire rose's species, which have different colours, scents and shapes. Unfortunately today it is the last day that this wonderful land is opened to visit :( so all of us will wait next spring to visit again. If you visit Rome during May this place is your must have! WOow AND the (giddy) way your wear these micro short denim shorts in such flowering frame (absolutely) does not fail to compose a (so mesmerizing) kind of "Vavavoooooooom(icious)" poetry I (shyly) must say Dear !!! wow che bella sembri una modella! E adoro questo look! Il roseto è davvero un posto splendido... e la mombasa una delle più belle borse di sempre! Grazie!! !L'Aventino è uno dei luoghi di Roma che preferisco:signorile ed elegante. Tom Ford è uno stilista molto creativo, che sa accostare l'eleganza all'originalità di materiali e capi, la mombasa è la riprova. Thank you!! !Aventino is one of my favourite place in Rome: exclusive and elegant neighbourhood. Tom Ford is one of the most creative man in fashion world who mix elegance with innovative material and shapes, Mombasa bag is the simbol of this.